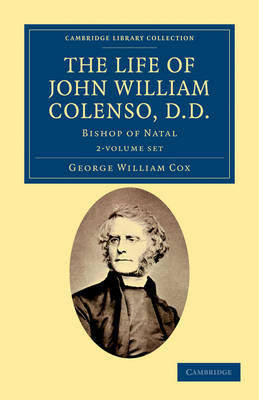 The prolific nineteenth-century historian and liberal churchman George William Cox (1827-1902) published this biography of the controversial bishop John William Colenso (1814-83) in 1888. Appointed the first Bishop of Natal in 1853, Colenso oversaw the completion of the cathedral in Pietermaritzburg and the building of churches in Durban and Richmond, established mission stations and learned Zulu. He was heavily criticised for his tolerance of Zulu practices and for his view that the Old Testament was not literally true, and was eventually excommunicated, though he retained a loyal following. Cox remained a fervent supporter, and was later nominated (unsuccessfully) as Colenso's successor. Volume 1 covers Colenso's early years in Cornwall, his education at Cambridge, his appointment as bishop, and the furore surrounding his theology. Volume 2 covers the period from 1865 to Colenso's death, focusing on his support for Zulu rights in the face of colonialist injustice.